One quarter of the world's population lives in karst terrains, yet karsts are highly vulnerable to stresses caused by human activity. This book surveys human impact on karst water, showing that the increasing pollution of the environment has, to a great extent, spoiled sensitive karst ecosystems. This text examines such consequences and offers proposals for future solutions and strategies. Part One provides an overview of the functioning of karsts and of human interaction with karst environments over several millennia. 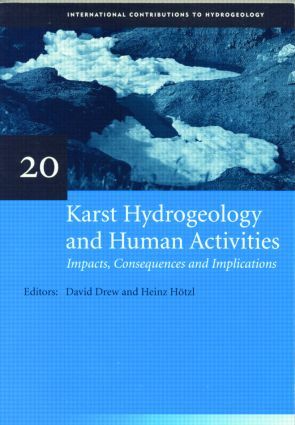 Part Two consists of a systematic examination of the major areas of human activity affecting karst waters, such as agriculture, industry, mining and water exploitation. Finally, Part Three views the effects on karst groundwater within a broader societal and legislative perspective and considers possible changes of methodology and approach.